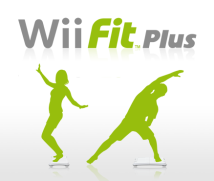 What do you most want to say to our customers concerning the new Wii Fit Plus? As I mentioned, I want them to enjoy it in a more relaxed way. Just switch on the power and you’ll be able to enjoy everything after that with the minimum of hassle! Getting the user to switch on the power in the first place is a huge hurdle to overcome, but once the power is switched on, the degree of satisfaction the user will feel with the software has increased significantly. So this means that all I really want is for the user to switch the console on. With the original Wii Fit, a fair proportion of users felt that it was all too much hassle and gave up on it halfway through. But once you've started, I am sure your body will let you know the way in which you should continue using the software in your daily life. So what you're saying is that you've strived to remove all of those elements of the software which previously had customers feeling: "This is kind of a pain…"
Yes, that's right. The Wii Fit Plus Routines option is the easiest place to get started. So you might think, for example, today I want to do a routine for 30 minutes or for 40 minutes, and then simple training exercises will appear straight away. In the original Wii Fit, it would always give you an explanation before each separate type of training exercise and when you'd finished an exercise, it would evaluate your performance. But when you actually train in a gym, you'll go from one exercise to the next in a smooth way. So while you might be told: "Drink a little water now", you'll keep on going through the programme of exercises, one after the other. With Wii Fit Plus this time round, it has that same kind of flow, and you'll be exercising for 30 or 40 minutes. For that reason, I would like people to use the software with the sense that they are actually doing a session at the gym. You've added new training exercises on top of the 48 different varieties that appeared in the original Wii Fit, haven't you? We've added another 21 types of training exercise… But I don't actually want to make too much of this here. I feel that if I emphasise this feature, there may be people out there who get the mistaken impression that this is a sequel to Wii Fit. A sequel is when users who were basically satisfied with the original software have the chance to purchase additional data that follows on from the original. But in the case of Wii Fit Plus, we didn't want it to be taken in that way by the consumer. As I said at the start of this interview, I want everyone to use this to get an enhanced version of Wii Fit. I want to say: "With this, you'll transform your Wii Balance Board into something even better!" "Convert your Wii Balance Board into the latest model!" Exactly. If we just state that the number of training exercises has increased, users who were not fully satisfied with the previous title aren't going to be interested no matter how many new exercises there might be. That's why when we made Wii Fit Plus, our highest priority was to get those users who might have drifted away from Wii Fit to regain interest in it. At the same time, the number of training exercises has actually increased which has added hugely to the fun. So while it's obvious that by increasing the number of types of training exercise, it's become more enjoyable, no matter how much we might repeat this fact, it wouldn't spark any interest with the people we most want to reach. Precisely. 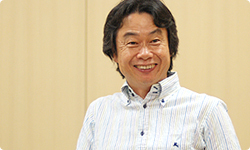 That's why, as one of the people who created and sold the previous title, I would actually like to go door-to-door to each and every user who bought Wii Fit and say: "Please exchange your old copy for this new one!" Though that would entail going round more than 3.5 million homes in Japan alone, wouldn't it? But the more I heard you talk about it, the more I felt that it was an enhanced version which was the same as new versions of operating systems or business software. That's why, if I'm being perfectly honest, I was rather worried at the start about how Nintendo would handle this kind of software, as it's not something we've ever dealt with before. As it's an enhanced version, now every retailer will get rid of Wii Fit from the store front displays and will replace it with Wii Fit Plus. The sales strategy which we decided on was to target the product at all of those customers who are already enjoying Wii Fit, by doing all we could to make Wii Fit Plus available at an affordable price. As for me, I want as many people as possible to continue to use this software as I believe that they are bound to see beneficial results if they do. It's something you can enjoy in a very simple, accessible way - just like going to a fitness club. 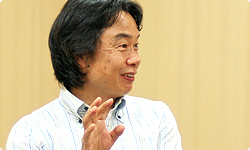 Now, Miyamoto-san, I believe I'm right in saying that you were working on three titles at the same time: Wii Sports Resort9, Wii Fit Plus which we have been discussing today and, in addition, New Super Mario Bros. Wii10. 9 Wii Sports Resort is a sports title released on Wii in June 2009 in Japan and July 2009 in Europe. In the game, the user can enjoy 12 different sports on a tropical island resort. The jogging, cycling and flying activities in Wii Fit Plus also take place on the same tropical island, known as Wuhu Island. 10 New Super Mario Bros. Wii is the latest title in the Super Mario Bros. series, offering four-player simultaneous play. It is scheduled to be released on Wii this winter. Out of those three titles, the one which went most smoothly was Wii Fit Plus. I suppose that would be because you had a clear vision from the start of what needed to be done to improve the software. Yes, that's right. I could see what I wanted to do right from the start, and thanks to that, I was able to devote my energy to New Super Mario Bros. Wii. Right! (laughs) As someone who has worked with you closely over the years and spoken with you many times, I've realised today how much I still don't know about you! Ah, that! Well, I love measuring things. (laughs) So the measurement-obsessed Miyamoto-san created Wii Fit because he thought it would be fun to plot daily weight measurements on a graph. Then, in order to get people to continue doing that every day, he made Wii Fit Plus! 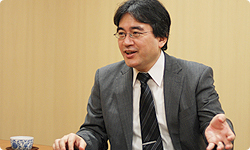 Iwata-san, why don't you try carrying a tape measure around with you?